This tool allows Chinese teachers and parents to create Chinese word to picture matching worksheets for young learners. You can also add the Pinyin or English translation of each Chinese word as a hint. Before you hit the Print button, make sure you click the image button to upload or look up an image for each Chinese word. Enter the Chinese character or word. Click the P button to add Pinyin automatically. In the case that there are multiple pronunciations for a particular character, the system will attempt to use the right one based on its context. In some cases, the user may have to edit it. Note Pinyin must be entered with tone numbers. The system will convert them to tone marks when the PDF sheet is generated. 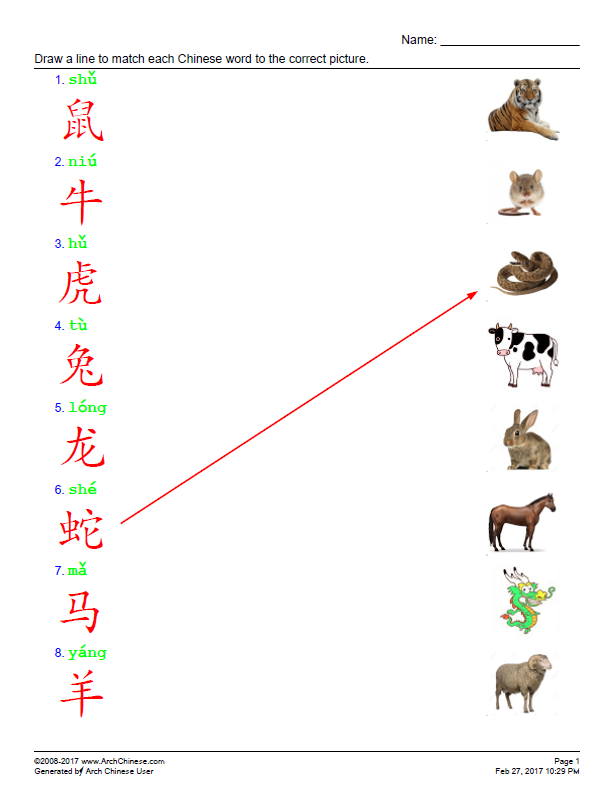 In addition, the Pinyin syllables must be separated by a blank space. As an example, for the Chinese word 哪儿, the Pinyin must be entered as na3 er2. Use v for ü, for example lv3 for lǚ, and number 5 for the neutral tone, e.g. ma5 (吗). Click the image button to upload or look up an image for each Chinese word. Optionally, change the default settings. Click the color buttons to change foreground colors for Chinese, English, and Pinyin. Click the Print button to generate the PDF sheets.